Here are some photos of Laura during voice recording of her character "Blue Fox" in the Captain Canuck Web Series, Yesterday, June 16, 2013 at Smiley Guy Studios in Toronto. 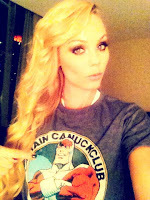 Remember to visit the album on the Captain Canuck Facebook Page: LINK . Other posts about this topic: LINK. In these pictures, Laura is so cute.